I watch The Next Iron Chef like it’s the Olympics. Once the battle is announced, I immediately start to formulate a recipe in my head. It’s my delusional way of participating. At the end of an episode a few weeks ago, two chefs, Geoffrey Zakarain and Anne Burrell were asked to make a dessert out of Kikkoman Panko Bread Crumbs and Ponzu Sauce. Mr. Fits gave me a strange sideways glance. Anne Burrell, then, proceeded to MAKE a Ponzu caramel sauce. Which put a smug smile on my face. Until she lost. In her defense, the judges loved her dish and Zakarain went on to win the tittle of Next Iron Chef. Although my personal favorite was Elizabeth Faulker, I do believe that Chef Zakarian was the perfect choice. His very first battle as an Iron Chef on Christmas Day earned him a PERFECT score. The next day I couldn’t stop thinking about the idea of a dessert with Panko and Ponzu. 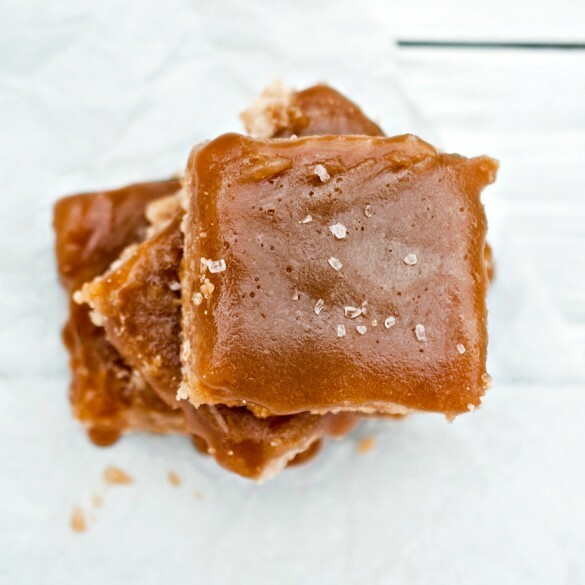 Of course the recipes battled on Next Iron Chef aren’t written down, I have no idea how she made her gorgeous caramel, so I just had to leave it to my own devices to come up with one. While this is rolling around in my head, I get an email from a lovely and adorable PR girl from Kikkoman whom I had met at IFBC in November. She wanted to know if she could send over a box of Kikkoman goodies for me to play with. Ummm…Yes. Yes you can. 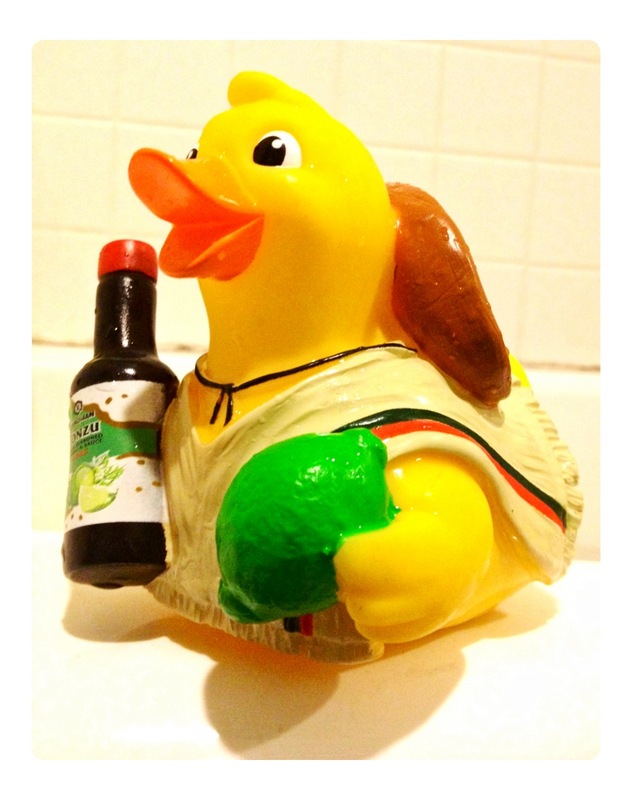 She even included a Kikkoman rubber ducky for Tater. Although I still can’t figure out why he is wearing a sombrero. So it was fate. I would be making a dessert out of Panko and Ponzu. Line the bottom of an 11 x 7 inch baking dish with parchment paper, allowing the paper to go up and over the edges of the pan. In a food processor, combine flour, brown sugar, Panko and salt, pulse to combine. Add the butter and process until combined, about 1 minute. Press the shortbread into the bottom of the baking dish in one even layer. Chill in the refirgerator for 30 minutes. Preheat the oven to 350. Bake for 20 minutes or until a light golden brown color. Allow to cool. In a large pot over medium high heat, combine the sugar, corn syrup and ponzu sauce (mixture will bubble to a large volume during cooking). Stir until the sugar has dissolved. Allow to boil, without stirring, until the mixture reaches 230 degrees, about 5 minutes. While the caramel is cooking, do not stir, but swirl the pan every 30 seconds to redistribute the caramel sauce evenly. Once 230 degrees is reached, add the butter a few cubes at a time and stir, allowing the mixture to return to 230 degrees. Remove from heat and stir in the cream, adding slowly. Pour the caramel over the shortbread and refrigerate for 4 hours, top with sea salt. Remove from pan using the parchment paper and cut into squares. looks good. will have to try. Wonderful recipe! I love innovation, I should really try this dish! Oh wow, this had fate written all over it! I am so intrigued by the ponzu in caramel, I bet it adds a whole new dimension. Love the panko shortbread too. Very creative! This is such an awesome idea! The panko thing is brilliant. I’m not crazy about shortbread, but this is something I’d be curious to try. This is a brilliant dish! I love it! I watched it and was SO disappointed – I thought Chef Anne’s dish was nothing short of spectacular! ….and these are pretty amazing, too! When they listed the ingredients, I was completely stumped! I would have never thought of caramel! BRAVO! amazing! yummmmmmmmm! make our mouth water! These look amazing, will have to give them a try. By the way, I love Geoffrey Zakarian. I wanted to try out his restaurant in New York recently, but couldn’t get in. Maybe next time! Next time for sure! I’ve been a fan of his for a while. And Elizabeth Faulkner, so I was SO excited to see them battle it out! Oooh this sounds so interesting! I bet it’s so tasty. I wanted Elizabeth to win too, but I agree Geoffrey is a good fit. Great job with this! !